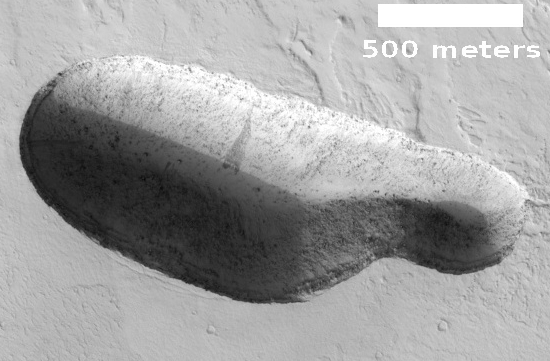 Today’s selection of cool images, all found in the January image release from the high resolution camera of Mars Reconnaissance Orbiter (MRO), include a handful of new pits near Arsia Mons in the volcanic Tharsis Montes bulge, such as a lonely and very distinctive pit to the northeast of the volcano, a second lonely and very distinctive pit to the north of the volcano, and finally the line of three shown in the image to the right, cropped and reduced to post here, with the original viewable by clicking on the image. It is hard to say if any of these pits would provide access into that lava tube. Even a close look at each does not provide enough detail to see whether any passages continue under their rims. If I had to guess, from the image, I would say that access is blocked. 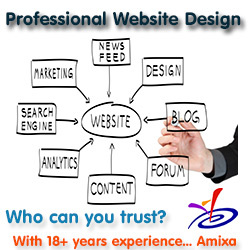 However, there is another detail in the image that suggests otherwise. Note the dark trails to the west of all three pits. These suggest that the prevailing wind is blowing material from the pits in this direction. The problem is that it should be difficult to get the material at the bottom of the pits up to the surface, unless these pits provide open access to a larger interior underground volume. The temperature and pressure differences between the surface and the interior would sometimes cause the atmosphere in the lava tube to expand, causing air to blow upward out of the pits and bringing with it fine particles from below that the surface winds could then catch and deposit to the west. Whether these pits are volcanic in origin I do not know. 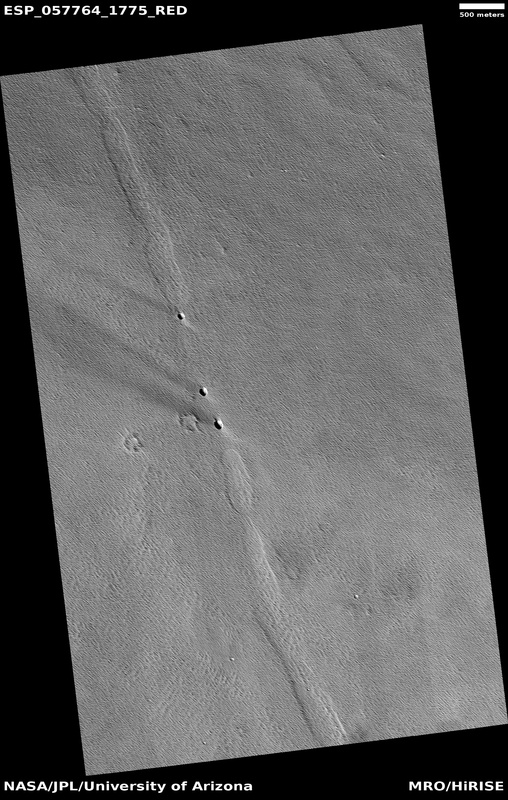 Their trend points directly away from Olympus Mons, which suggests they might be evidence of an underground lava tube. Olympus Mons is quite a distance away, however, which makes it unlikely that the pits are related directly to the volcano. 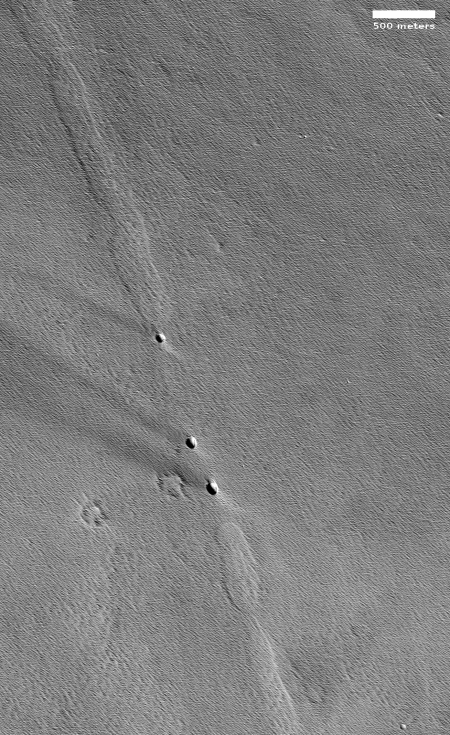 The MRO January image release also includes another similar line of sinkholes in another area of the northern lowlands, this time in Utopia Planitia, at 22 degrees north latitude and 118 degrees east longitude. In this area are many similar fissures and linear sinks that appear more likely caused by faults and fissures in the ground than lava tube flows. The area has not been photographed as thoroughly as the pits in Amazonis Planitia, so it is hard to get a full sense of the geology there. While this pit might not be volcanic, it quite possibly could be a good access point to undergound water. 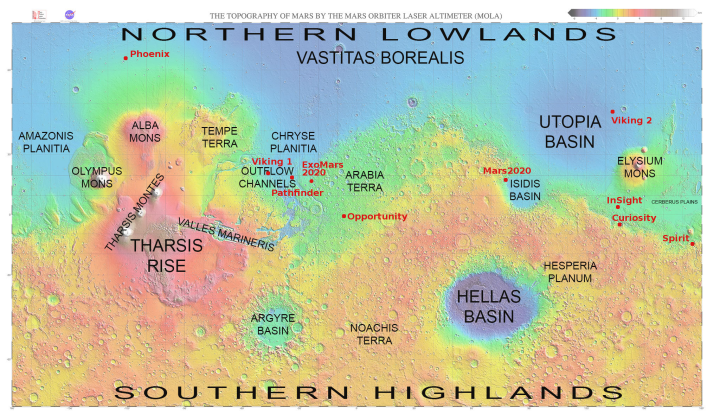 It also, to my mind, reinforces the hypothesis put forth in the paper I highlighted yesterday, that a water ice table probably exists below the surface almost everywhere on Mars. And if it doesn’t, it is still likely from the building evidence that there are many places where it does exist and be accessible. For general reference, the global Mars map below shows the general locations of all these regions, and how they relate to each other as well as to the locations of all past and planned landers/rovers. What’s in there? An albino Crayfish? Maybe some tiny Daddy Longleg? Do you Grock? As a spelunker all those potential challenges must make you drule.